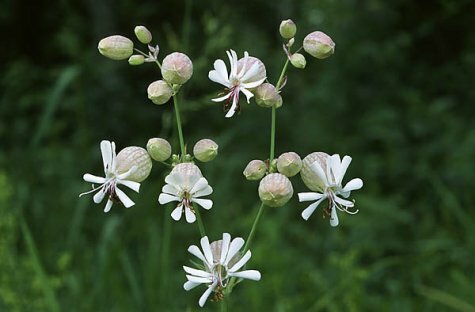 The flowers of the bladder campion stay open all day and night, but the scent comes only in the evening. A quite common flower until September. It is found at roadsides and field verges, on wastelands, dry sparse grassland and in light sparse forests. In dense grass the plant cannot manage the competition. A bluish-grey-green, lush and hairless plant. The flower sheath (calyx) is pink and bursts with a little bang when crushed, so it is the "popping grass“ for children. Up to some twenty flowers on one plant collected in inflorescences. Keeps long in a vase, the flowers continue to develop.